The House Ways and Means Human Resources Subcommittee is holding a hearing today on subsidized employment as a tool for boosting economic security. It is high time for Congress to re-examine the evidence on subsidized jobs and to discuss the potential this approach may hold for alleviating our country’s continuing unemployment woes and connecting disadvantaged workers to job opportunities. Five years into the economic recovery, the unemployment rate is slowly approaching prerecession levels. Yet, the reality is that certain groups have largely been excluded from job growth. Subsidized jobs programs would not replace the need for broader labor policy action, such as a much-needed increase in the minimum wage and widespread job creation. However, these programs represent an important tool for ensuring that all who seek employment have the opportunity to participate in the labor market. Under subsidized jobs programs, the government reimburses employers for some or all of an employee’s wages, subject to specific conditions. Unlike direct public-sector employment initiatives, subsidized jobs programs engage the private and nonprofit sectors. Sometimes subsidies are paid for only a short period of time and are phased out quickly, primarily providing employers with an initial hiring incentive. In other cases, subsidies might be continued for as long as the business retains the participating employee, inducing businesses to expand and take on additional employees whom they would not otherwise have hired. In recessions, when unemployment is widespread, subsidized jobs programs typically have the objective of providing immediate work opportunities to struggling families, stimulating the local economy, and temporarily assisting hard-hit businesses. But subsidized jobs programs can also play an important role during nonrecessionary times: They can encourage businesses to hire specific target groups of workers, providing employment opportunities to those who have been “left behind” in the job market. Early subsidized jobs programs in the 1970s and 1980s focused on supporting employment and income among workers with significant barriers to employment, such as ex-offenders and welfare recipients. But more recently, subsidized jobs programs funded under the American Recovery and Reinvestment Act of 2009 were shown to be effective among a much broader range of workers, such as the long-term unemployed and disadvantaged youth. 1. Subsidized jobs could provide a hand up to groups that have been left out of the economic recovery, benefiting both families and the economy. Although progress has been agonizingly slow, the unemployment rate continues to tick down toward prerecession levels. 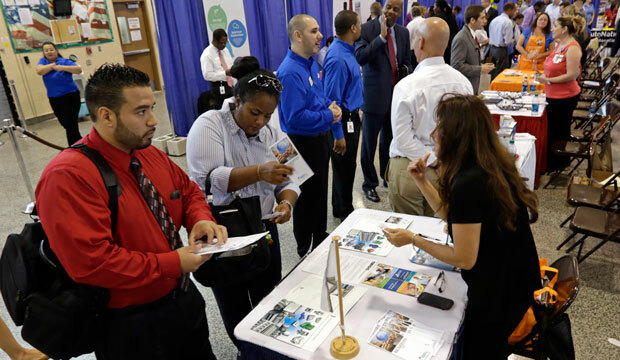 But some groups—such as the long-term unemployed, noncollege-bound youth, and persons with criminal records—have not shared in the nation’s job growth. The long-term unemployment rate, for example, is still three times higher than before the recession. The unemployment rate among those ages 16 to 24 is twice the national average, and is even higher among minority youth. Prolonged spells of unemployment lead to social costs beyond personal hardship for unemployed workers and their families. For example, workers who cannot find a job often must turn to public assistance for support. Unemployment among ex-offenders is associated with an increase in recidivism, resulting in judicial and prison system costs. Older workers who experience long unemployment spells may be forced to retire early, resulting in decreased tax revenues. Finally, without access to jobs, many families fall into poverty; the economic consequences of childhood poverty on society are well documented. For the sake of both affected families and our economy at large, policies that offer employment opportunities to workers who have been left out of labor-market gains are a win-win for all involved. 2. Recent experience shows that subsidized jobs programs work. As part of the American Recovery and Reinvestment Act of 2009, states were offered federal funding from the Temporary Assistance for Needy Families Emergency Fund, or TANF EF, to create subsidized employment programs of their own design. Thirty-nine states and the District of Columbia implemented TANF EF programs. Each state tailored its program to suit its own local economy, independently setting program goals, determining target populations and eligible employers, and designing the subsidy structure. All told, during 2009 and 2010, states placed 260,000 workers in subsidized jobs using $1.3 billion in funding. Research by the Economic Mobility Corporation indicates that these programs successfully achieved states’ objectives, including creating new jobs that would not have otherwise existed, increasing earnings among struggling families, transitioning participants to unsubsidized work, and assisting local businesses. When TANF EF funding expired in September 2010, some states chose to continue a version of their subsidized jobs program using state or local funds, in spite of the challenging fiscal environment. As documented by Elizabeth Lower-Basch of the Center for Law and Social Policy and LaDonna Pavetti of the Center on Budget and Policy Priorities, states’ TANF EF programs provide a valuable set of case studies for how subsidized employment programs could operate today. 3. Subsidized jobs programs would have bipartisan backing. Lawmakers from both sides of the aisle can get behind subsidized jobs. Progressives and conservatives alike agree that a good job is the best pathway out of poverty, and subsidized employment offers a foot in the door for many workers who have been shut out of labor-market opportunities. Subsidized jobs programs also offer an opportunity to help small businesses expand and increase local economic activity. Former Gov. Haley Barbour (R-MS), a former head of the Republican National Committee, urged Congress to extend TANF EF funding past its scheduled 2010 expiration, pointing out that the program would “provide much-needed aid during this recession by enabling businesses to hire new workers, thus enhancing the economic engines of our local communities.” For these reasons and others, many conservative and progressive policymakers favored extending national funding for subsidized jobs programs in 2010. In 1992, then-President Bill Clinton famously quipped, “the best anti-poverty program is still a job.” But when job opportunities remain elusive for whole groups of workers—even as economic conditions improve—these workers are denied the chance to protect their families from poverty and hardship, and chart a path to the middle class. As Congress evaluates the evidence on subsidized jobs programs, our lawmakers should consider subsidized jobs as an important strategy to increase economic mobility for those workers who need to get a foot in the door. Rachel West is a Senior Policy Analyst with the Poverty to Prosperity Program at the Center for American Progress.